You may have seen me announce that I was producing another Nia class with a guest teacher. “Producing” just means that I communicate with the teacher, secure a venue, and promote it as much as I can. 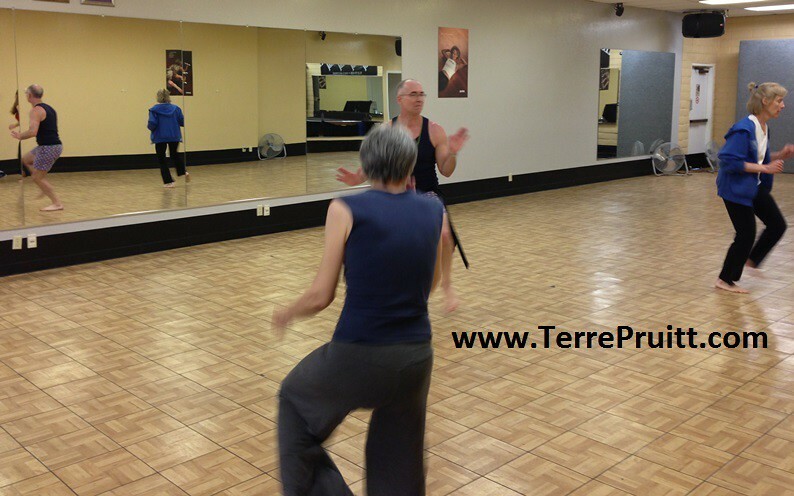 The guest teacher does the routine or playshop work and presents the material. I have had this guest teacher come teach a couple of times before. Jason Alan Griffin is a first degree Nia Black Belt and he travels the country with his dog River, and he teaches Nia. In March of 2015, he was going to be in our area so I invited him to present his FreeDance Playshop. Then since he was going to be here on Friday, I asked him to do his based-on-Nia-routine Frankie Say Nia. So we had a Nia class on Friday, then the playshop and a class on Saturday. He happened to be passing through our area in August so I invited him back to do Frankie Say Nia again because it was so fun the first time. This time around he was traveling with a few routines and the one I thought would be the best for the Nia community here was “Amazing”. It is appropriately named. 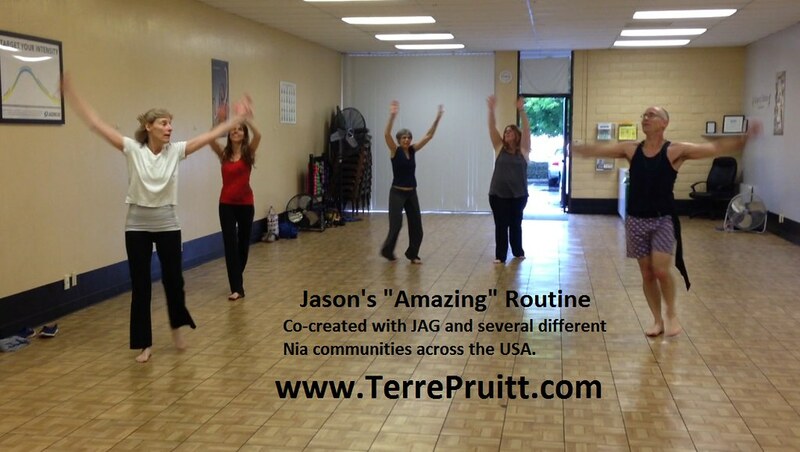 A small group of us danced Amazing with Jason on Friday, May 06, 2016. Amazing came about through Jason’s desire to share all the wonderful Nia energy he experiences during his trips. He said he was bringing his work and sharing it, but sensed a lot of creativity out there and he wanted to embrace it. So he invited Nia communities to contribute songs from their areas. Then as he visited each area and each Nia community the choreography was revealed. It was either revealed by the community already having done it or by a collaboration. Now he is spending several months on the road bringing this routine to many Nia communities around the country. He has a few other routines that are on the menu Orchestra, Woodstock Experience, and Floorplay . . . all sound super fun by their descriptions. The focus of Amazing is on connections and directions. We moved in all directions and were encouraged to sense the connection. As with many things in Nia the connection could be one of or all of the BMES. So we could have been connecting with the Body, the Mind, our Emotions, or Spirit. We were invited to connect with people in the room, in the Nia community, and any where. The intent was to explore something new and return home renewed. And again, as with many things in Nia, that could relate to the BMES. As an example we would extend our arm and try a new movement for our hand, then return our hand back to our center or our “home” and sense if there was a change or some new or different kind of sensation. It was super fun. A question occurred to me today as I was thinking about writing this post, “Do I just think it is fun because I am not a student often and so any chance to dance Nia is fun?” Then I pictured the e-mails I received telling me it was fun. I remembered the comments after class. It was fun. We have fun when Jason teaches us. So, even though he is planning on taking a year off from traveling, I am hoping that a quick jaunt down the coast to us won’t be considered “traveling” and he will come back next year to teach us again. I really want to try that Orchestra class. Below are some pictures from the class. I do hope one day you’ll come dance with me! 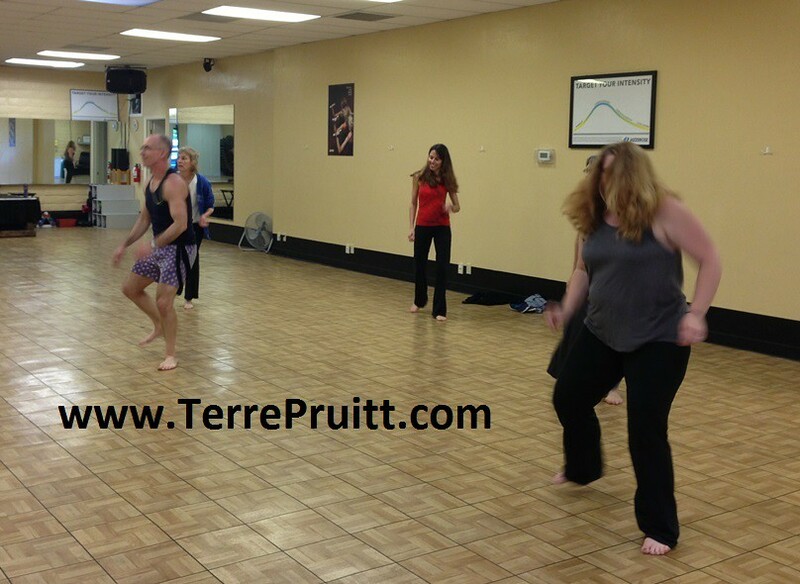 If you want to see MORE pictures and a video from the class please visit my site. Today we had a workshop to talk about and discover the Nia Five Sensations. 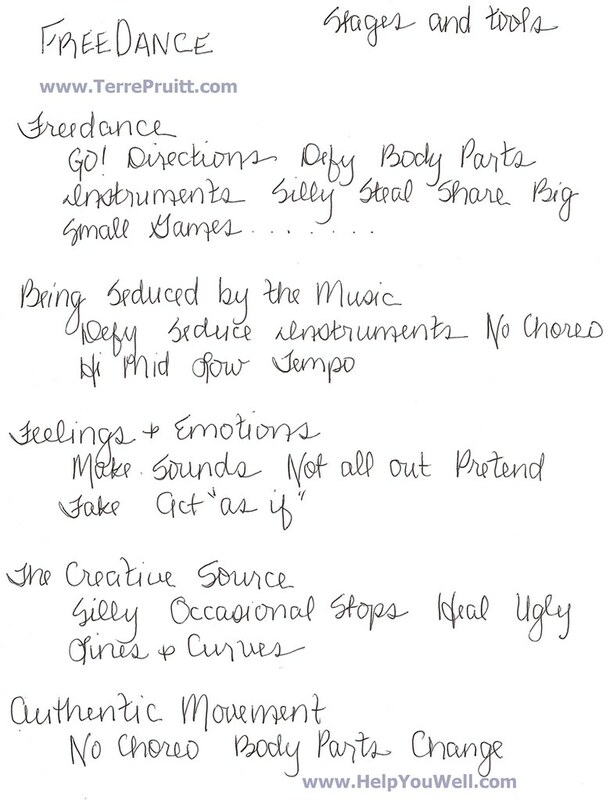 Just like a lot of things we do and use in Nia, the five sensations are not unique to Nia, but they are tools we use to enhance our dance exercise. In a Nia class we strive to be in sensation. Being aware of the sensations allows us to choose and dance what we need at the time of the class. We had a small turn out, but the number of attendants is never the measure of success. One of my Nia Students and fellow Nia Blue Belt’s helped me present the workshop. This workshop was held at the request of the Camden Community Center. Our participants shared that they felt they had a better understanding of the sensations and would be able to apply awareness to them either in a Nia class or just in everyday life. First we started off moving right away. The participants walked in, we said hello then started dancing. We danced to two songs. Then we did a brief introduction of Nia then we shared the five sensations and how we experience them everyday. We shared how they could be helpful to know and be aware of in a Nia class. The 5 sensations are: Flexibility, Agility, Mobility, Strength, and Stability (FAMSS). Then we moved to each sensation. As we talked we guided the students into the sensations. We shared that flexibility is sensed as energy moving outward. It is the opening your body, the lengthening and yawning. So we stretched and yawned our bodies open. We reached out to lengthen our limbs. We imagined our bones moving away from our center. We practiced sensing the sensation even as our bodies showed no outward movement. We talked about how agility can be sensed in the quick start and stop of a movement. It is the physical feeling of pulling and pushing. We hopped and jumped. We chopped and slapped. We “played” soccer and tennis. We danced in a “strobe like” fashion. We even stood still and let our gaze bounce around as our eyes moved with agility. When talking about mobility we said it is sensed as energy in constant motion. It is youthful freedom. (A description from the Nia Technique that I really like.) It is flowing movement, graceful, and easy. We twirled and whirled around the room. We let our bodies ebb and flow. We rolled like the ocean. We moved our arms. We moved our legs. We mobilized our spine. We allowed the energy of constant motion to energize us. We used the ballet bar and wall to start us off understanding that strength is sensed as energy moving inward. With that first example it gives way to us sensing strength as a resisting, or a quality of weighted energy being moved in ways that allow you to sustain a movement or posture. It is the contraction of muscle. It is the muscle squeezing bone. We contracted and pushed. We squeezed and resisted. Allowing the effort to tire us a bit. Then we experienced the calm of stability. Stability is sensed as balance and comfort. It is the physical feeling of harmony and peace combined with readiness for action. After having practiced the sensations we then added them to the stances that are part of the 52 Moves of Nia. We moved through the stances in the 5 sensations. Then we put on the music and danced the stances in sensation. After two songs we reviewed the kicks that are part of the 52 Moves of Nia. We moved through the sensations doing the kicks. Then onto dancing again. We danced doing our kicks in sensation. We finished off the workshop with two songs focusing on the sensations, but primarily using the Nia choreography and not so much sticking with the kicks and stances. This allowed us to practice dancing in the sensations to whatever moves that come as part of a Nia routine. It was a great little taste of the Nia 5 Sensations. I can say that because no matter what I am teaching it is ALWAYS the students that make the class GREAT! Are you aware of any of these sensations in your everyday life? What Do You Mean Nia FreeDance Tool? Some of you may be wondering what I mean when I say Nia FreeDance Tools. Recently I invited First Degree Black Belt Nia Teacher, Jason Alan Griffin, to present a playshop of his creation. The playshop was him sharing some Nia FreeDance Tools. I have talked about what Nia FreeDance is before, it is where there is no assigned choreography and we just dance to the music (or not). But it is not the type of dancing you would see in a club. It is not the type of dancing that has specific names for the dance moves . . . yeah a cha-cha, jazz square, or a pirouette might sneak its way in, but primarily it is not that type of dancing. So some of the tools we have to practice Nia FreeDance are the 8 Stages of Nia FreeDance. And within those stages can be additional tools. First of all as a reminder we do FreeDance to allow our bodies to move in different ways. To move in ways that are not our normal ways of dancing . . . so if you ARE a ballerina, the idea is to let your body dance outside of the ballet mold. If you are tap dancer perhaps in FreeDance your feet don’t tap. It is a way to practice different moves to music and allow our bodies to experience something away from its regular patterns. There are other reasons and ways a Nia Teacher uses Nia FreeDance, but I am just going to keep this post on the path of tools. So within the tool box are the 8 Stages as I mentioned. Now, in the playshop Jason did not mention these tools in association with the stages, but a lot of the tools he shared were introduced to me in connection with the first 5 stages of Nia FreeDance. So with Stage 1: FreeDance (Catch Phrase: Anything Goes, Movement-Wise) . . . almost all of the tools could be associated with this stage but one that sticks out for me is being silly, acting goofy. This is super fun and is pretty close to guaranteed to get you to move in a different way to music than you might be used to. Tools I associate with Stage 2: Being Seduced by the Music (Catch Phrase: Art of Listening) are as it says, being seduced by the music. So just letting the music take you away. I imagine most of you have had a song play where you can just get carried off by it. You can just move without thinking and dance away. There is also Tempo Change . . . this involves the art of listening because you are listening for the tempo and then dancing against it or with it or faster than it or slower than it or opposite of it. Just listening and moving to it — in your own way. There is also a tool that we use called “Forget the music” where you just dance in your own way — period. People might look at you and wonder what you are hearing because it might look to them as if you are not dancing to the music. And you could not be. Perhaps you don’t like the song that is on or you like a different version that you know so your dance is not “to” the music. Stage 3: Feelings and Emotions (Catch Phrase: Pretend, Fake It, Act As If ). This stage has a lot of tools that connect to it, if you are dancing the “Feelings and Emotions” you act “as if” you are ___________ (fill in the blank with an emotion). You could be ACTING “as if” you are angry so you stomp around the room. Or you are ACTING “as if” you are jealous or ACTING “as if” you are happy. Allowing your body to move in ways that it would move if you were feeling those emotions is a great way to move. Or you could PRETEND you are playing an instrument. I always say that I have become the greatest musician since I started teaching Nia. Or you could act as if you are playing a sport or a child’s outdoor game. This type of pretending is not sticking strictly to the stage and catch phrase, but it can be connected to it because there is pretending, faking, and acting. Stage 4: The Creative Source (Catch Phrase: The Real You). This is where there is no story or no acting “as if”, you are moving with your true emotions. The tool would be no choreography allowed, in fact the dance is suspended and you are moving in your own way as an emotional being. Stage 5: Authentic Movement (Catch Phrase: Change!!). Here is where the tool of changing every two bars comes in. The movement is authentic. The real you, nothing fancy just the way your body goes, but changing it every two bars. Or the change could be applied to directions or levels. You could dance going one direction and quickly change to go another directions. Or you could be dancing in the high plane and switch to the low or the middle. The idea is to CHANGE! So that is what we mean by “tools”. Basically ideas of how to move. There are a lot of tools that can be used, there are so many ways to move. One of the most fun things to experience is an individual actually practicing these tools and then coming up to me after class and saying what a great workout they received. Many say they didn’t realize that FreeDancing could be such a great workout. That is one reason why we FreeDance . . . it really is a GREAT workout! Having a lot of tools makes it fun! Does this give you a better idea as to what the “tools” are? Does this give you ideas for your next dancing-in-your-living-room session? Or ideas on how to conduct your next car-dancing moment? How Are Your Resolutions Going? We are almost half way through the first month of the year. So it might be a little late for me to be talking about resolutions, but I was wondering about them. I was wondering about yours. Do you make New Year’s Resolutions? If so how are you doing on them or with them? I know there are different types of resolutions. There are those that are long term so thirteen days in to the New Year you might not have any progress on them. Some, though, might be the ones you’ve resolved to do daily or that you would have progress on or with just shortly into the New Year. How are you doing on them? What are they? I don’t make resolutions so I have nothing to report, but I was wondering about you. I was wondering if you would like to share the status of your resolutions. If I were the type to make resolutions, I would have made one that had to do with getting my stuff straightened up and out a bit. I was planning on cleaning out some stuff last year but then my mom died and I ended up with a lot of her stuff. I’m a bit of a hoarder with some thing so it is not easy for me to just get rid of stuff. But doing so, getting rid of stuff is always on my mind. To me, since it is always on my mind and it is a constant thing that needs to be done, I don’t think of it as a New Year’s Resolution. Things often seem to get in the way of me doing any kind of cleaning out. Not easy to get going on sorting out when other things “come up” since I would rather be doing just about anything, but cleaning out closets. One thing that has come up – I am hosting a special Nia Class and Nia Playshop. Granted these events are going to be in March. There is still a lot to be done in the beginning. It takes time to work out the details and secure the venue. I would much rather be creating flyers and other marketing material than going through stuff and deciding what to get rid of. I will eventually have information on my site about the Nia Events, but for now I will say one will be a Nia Class done to 80s music and the playshop is going to be a Nia Free Dance Playshop! Mark your calendars for Friday, March 27, 2015 and Saturday, March 28, 2015. See, I get distracted by new and exciting things. Regardless of whether you make resolutions or not, I do hope your 2015 is starting out wonderful and continues on the path of being a spectacular year. I hope that you succeed in your goals, if you are the type to make them. What about New Year’s Resolutions? Do you make them? How are you doing with them? Do you get distracted from you resolutions? In Nia we have FreeDance. FreeDance allows for so many things. One way we FreeDance is we dance to the music with no choreography. We let our bodies sense the music and allow it to move us. 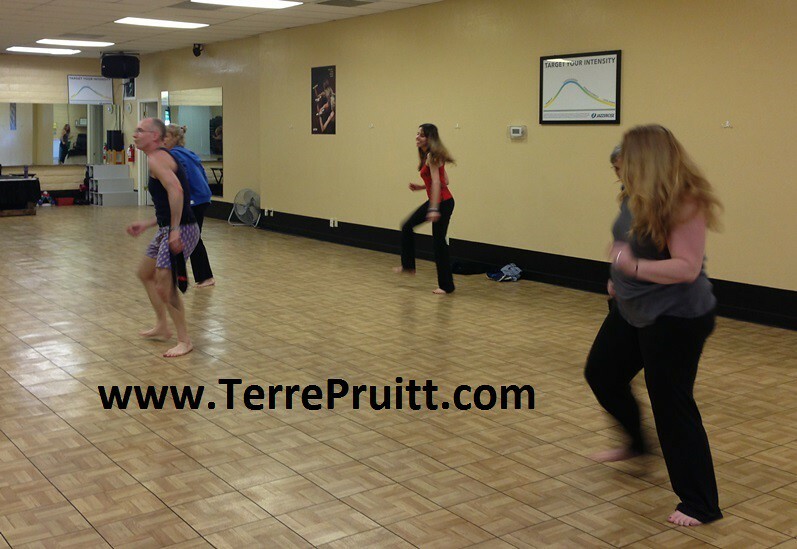 When we let our body move freely without thinking and without judging it is a great workout. Many of the Nia Routines have songs where there is no choreography and we just FreeDance, and many of the routines have choreography in addition to FreeDance. Our feet might have set patterns, but our arms and hands are free. Or our arms and hands might have the pattern and our feet are free. Many combinations of dance, choreography, and body parts. Nia FreeDance also has stages. A Nia teacher can call upon these stages for many things. The stages in FreeDance are used for learning a new routine, they might be used as a focus in a class, they might be used for a playshop, we have many options. In Nia FreeDance the fourth stage is The Creative Source – The Real You. With this stage during the White Belt Nia Intensive I participated in, we were instructed to remember a situation and tell ourself the story of the situation and allow ourself to feel the emotion of that situation. We all walked around the room telling ourselves a story. Some of us talked out loud, some of us were silent. All of us used the emotion the story evoked to move. Our movements might not have been considered a dance by some, because in this stage we are not necessarily dancing. We are not moving our bodies with the intent of dance, we are allowing the emotion from the story to move our bodies. Depending upon the story it could appear as if our movements were a dance. Yet, since we do “dance through life” in Nia, all of our movements are a dance . . . just not the typical dance. In this stage we are not intent upon dancing. The purpose of FreeDance is to the purpose of stimulate movement creativity. So we use the stages to assist in that. So using a story and the emotions along with the story can really allow for movement we might not have thought to bring to the dance floor. Some stories we use to practice stage 4 might be happy, some might be sad, some might be filled with anger, whatever the story and the emotion it is what moves us. In the intensive there was all types of movements when we practiced this stage. There was stomping, jumping, running, rolling, skipping, punching, kicking, screaming, laughing, smiling, frowning . . . . all types as you can imagine would occure with a group of people with many different stories. As stated this is a tool to awaken different movement. When we dance I think that we have a tendency to move in the same pattern. We might move in different patterns to different types of music or different beats, but there might just be a handful of different patterns. 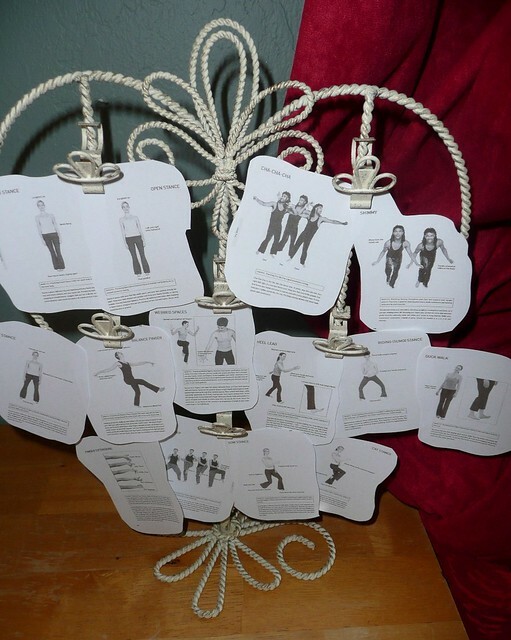 When we are challenged by using the different tools of Nia, when we practice and play with the eight stages of FreeDance we move in different ways. 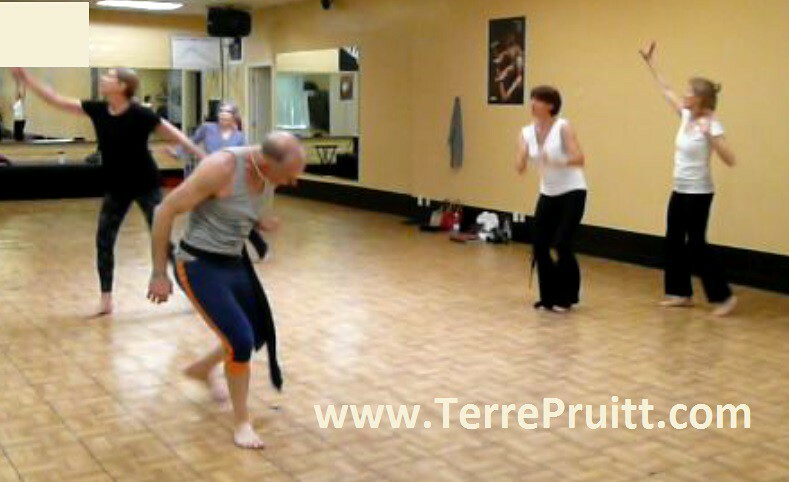 Sometimes muscles that don’t normally get to join us in our dance come alive. They are happy to be allowed to join in on the dance. Using different muscles than we normally do in our dance fuels the creativity even further. When you let go and FreeDance you will be surprised. Here I invite you to try this fourth stage of FreeDance. I suggest choosing music without lyrics. Sometimes lyrics and interfere with FreeDance when trying to practice specific stages because lyrics can sometimes compel certain movements or emotions. So music without lyrics allows for you tell the story and listen to your body’s response to the emotion. Well, what story are you going to tell? Today I taught Nia. It was not a Nia class, but a one-on-one session. No matter what I am teaching, a class, a playshop, a move, a song, an individual, I always learn things myself. It is amazing. Sometimes I am reminded of something. Today I was reminded of how fun it is to teach someone something new. To explain something in a way that allows them to understand. In some instances it might be the information is received and then there is still learning or “mastering” to be done, but they have the tool you gave them. In some instances they just have it. It just depends on what it is. But it is amazing. 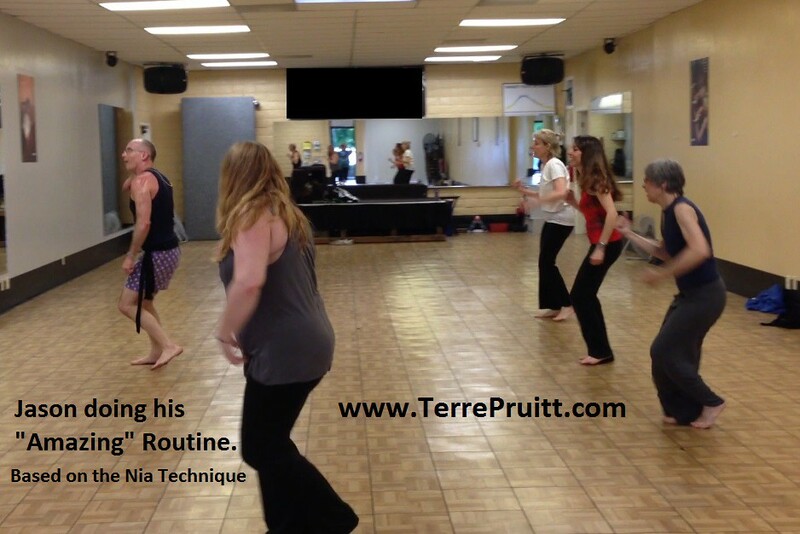 When I am learning a new routine I would love to be able to take a perfect “product” into my class. But there is often a point where I know it is not perfect, but I can’t learn anymore by myself. So I take it into class and usually that first time in that one hour I learn more than (or just as much as) I had learned in the time it I spent getting to the point I where I took it into the class. Amazing. I might have actually said this very thing before in a previous post, so it might sound familiar to you. Or it could sound familiar because you have experienced something similar. Learning as you are teaching. I love that! Well, it is May and for the past week, maybe two it has been cold and raining here in the San Francisco Bay Area. I don’t mind it so much. Especially since, as you may know, I have a new found love . . . making soups with my immersion blender! The last one I made I made it too spicy and I couldn’t eat it. I was very sad. But my husband loved it which was great because he was stuck eating the whole pot. I was thinking it would be the last batch before the warm weather comes in and I might have been right. The past two days have been pretty warm and very beautiful. It seems like spring might actually finally be here. During the cold one of my friends posted a picture of some of her flowers. She had cut them and brought them in the house and posted “At least it’s springtime inside the house.” She inspired me. 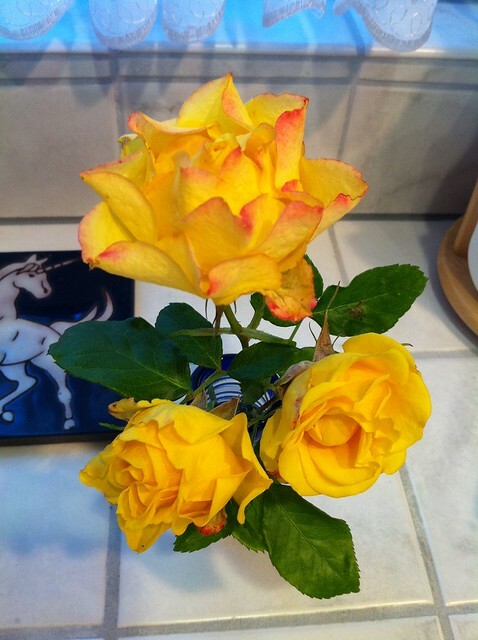 It took me a few days, but I cut these from a tiny rose bush we have in our yard. These are VERY small roses. The bush is probably not even two feet high. I just wanted to share. I wanted to share the beautiful flowers, the beauty in a sign of spring, the excitement of learning as you teach, the wonder and beauty of the world. I wanted to share and I wanted to say I am looking forward to living in the beauty that is, and learning as I go. There is a book about Nia. The Nia Technique Book authored by Debbie Rosas* and Carlos Rosas**. When I first thought of teaching Nia I bought it. I think I have said before that I thought Nia was a little too “woo-woo”. When I read the book it helped me see that Nia is based on the science and the design of the body. I often refer to my book. I have little tabs stuck on almost every page and that gets bothersome. 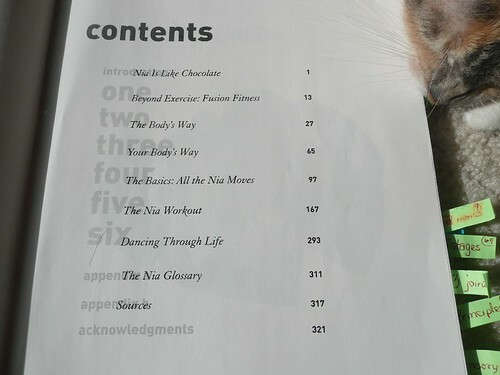 While the book has a table of contents it is sparse and it does not have an index. I always find myself searching and flipping and going back and forth in the pages because I can’t find what I want and I know it is there. Last week when planning the Nia Playshop I just flipped back and forth one too many times. So I created an index.I created an index of all the things I want to look up and arranged in alphabetically. I also arranged it so that there are subsections within the index. But then that seemed so long so I did an index with just the main sections and a separate index below of the subsections. So, yes, I have the index arranged three different ways so that you can have a choice on how to look at it. It’s on my site HelpYouWell.com. One of the “bothers”, cat eating tabs. If you would like a copy of the Excel format just let me know. I teach Nia in the San Francisco Bay Area. One thing I am trying to do is increase awareness of Nia and also, at the same time, increase my class sizes. So recently I hosted a Playshop in San Jose at the studio in Willow Glen where I hold my Nia classes. My topic for the Playshop was some of the 52 Moves of Nia. It was a success. I felt good about it, even though I put my students to work. I had spent a day and a half or so preparing what moves I wanted to go over in the Playshop and what Nia katas from the various Nia routines I wanted to use in the Nia Class. I wanted the class routine to include all the various moves we explored in the Playshop. I spend a couple of days between doing other things reviewing to make certain I was comfortable with my presentation and to make certain I could get through it within the allotted time. So I was confident the Playshop and the Nia Class would go smooth. What I was nervous about was being able to get in and set up. If you are a teacher of almost anything, you know that here is time needed to set up. Showing up early to set up and be ready to greet your students is not always possible with the time allowed in between workout classes. In exercise class situations sometimes there is NO time in between classes. They are scheduled to end on the hour and start at the same time. So I had scheduled 15 minutes in between, but there was still things that needed to be done and I wasn’t wanting to rush the class before us out. So I came up with an idea . . . . now, I would bet I am not the only one to come up with this and I bet if I were to do minimum research I would find all the “Planning a workshop” information to tell me exactly this, but I am still going share it. I realized that I could put my students to work! So I did. Most of the time people are more than willing to help. One of my students showed up really early—before me even. So I knew she was ready to do something. So I set her on one task. Then two of my students who I had been plotting to do this work all along were assigned tasks. 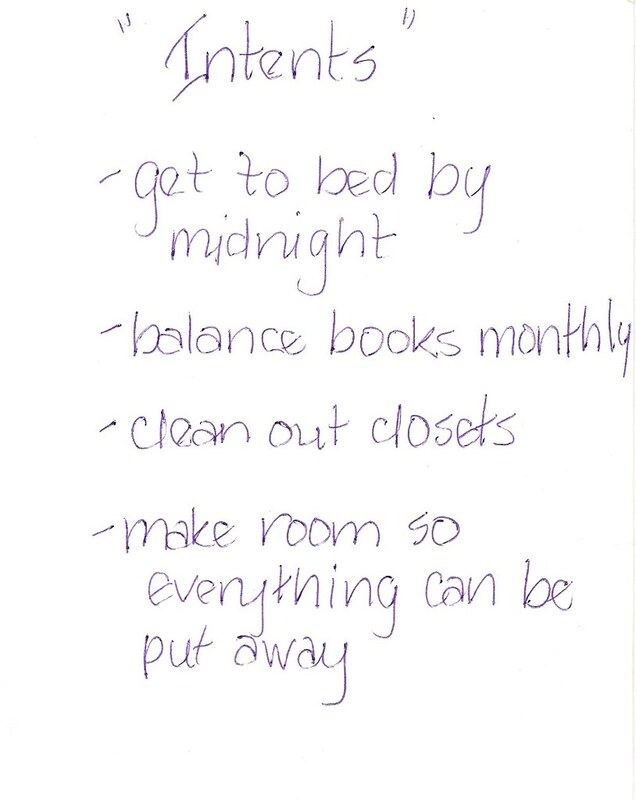 This assigning of tasks can also be connected to my post about “If You want something done right“. Because I had to be willing to “let go” and let my students do the tasks. And I have to say they did them beautifully. I was so proud. I was proud of myself for having thought of having them do it and I was proud of myself that I just let them do it. And I was especially proud that they did it so well. I believe they did better than I could have–it was awesome. It was a great learning experience for me. My hubby (thanks, Hubby!) also came to help. With him mopping the floor and some of my students setting up the room, I was able to concentrate on the participants coming in that needed to sign waivers and get settled. All of this allowed us to start on time . . . which allowed us to end on time — for the Playshop at least. The Nia routine I put together was a little longer than an hour so we went over on that. But all-in-all it was my students that allowed me to have a successful Playshop. With Nia you get a workout. It is not necessary to have any experience in any type of dance modality or martial arts, or any type of practice (Yoga, Pilates, etc.). Any BODY can walk into a class and join in and following their own body’s way get a great workout. When you learn the move you are learning the name, you are thinking about the move. The concentration is on placing your feet in the proper place, learning where your limbs are supposed to be. Maybe trying some of the different intensity levels and the different planes. This is the stage where you are actually doing a lot of thinking. This is the stage we you move the move. You are doing a routine and just moving. Getting the moves into your muscle memory. Your body is learning the move. Here is where you are learning the combinations. This stage is where you let your body lead and you don’t think too much. The body has an intelligence of its own and if you let it sense it can flow. This is the stage that you can achieve once your body knows the move. This stage could be during a song the first time you do it, if you feel comfortable and your body senses the moves you might be able to just put the energy into it from one of the Nine Movement Forms. Or it could be the stage you get to once you have done the song a few times. It really depends on the you. It depends on how you feel and how you sense the music. 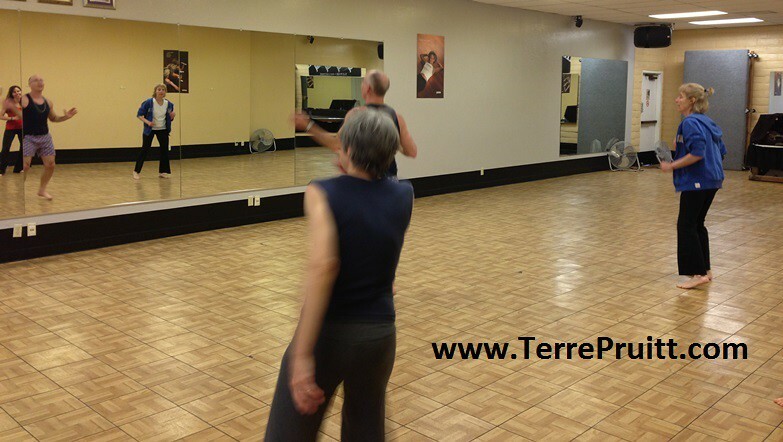 But this is where we really get to play with our routines, where we can energize with the energy of T’ai Chi, Tae Kwon Do, Jazz Dance, or Yoga. 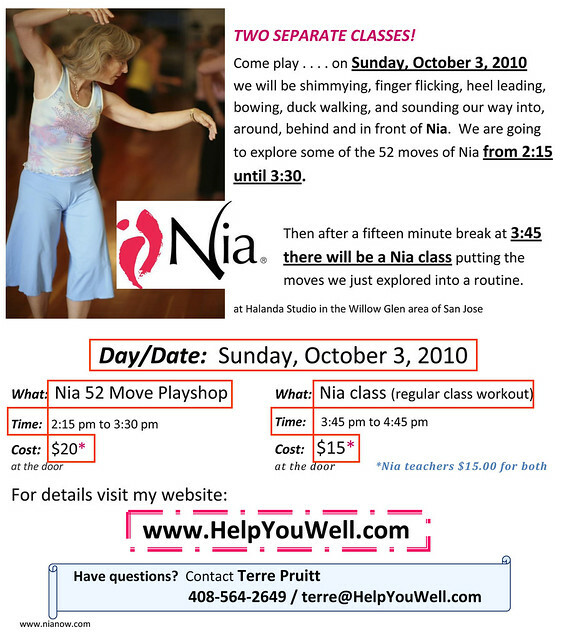 This weekend (10/03/10), in Willow Glen/San Jose I am holding a Nia Playshop where we will Learn the Move. We are going to play with some of the moves that make up the 52 Moves of Nia. Then after we are going to have a Nia Class where we Move the Move. Since we will have spent an hour Learning the Moves I am hoping that some of you will be able to Energize the moves. See you Sunday!